Cisco predicts the global IoT market will be $14.4T by 2022. IC Insights predicts revenue from Industrial Internet IoT spending will increase from $6.4B in 2012 to $12.4B in 2015. IoT in manufacturing market size is estimated to grow from $4.11B in 2015 to $13.49B by 2020, attaining a CAGR of 26.9%. With the potential to streamline and deliver greater time and cost savings to a broad spectrum of enterprise tasks, opportunities for Internet of Things (IoT) adoption are proliferating. It’s encouraging to see so many industry-leading manufacturers, service providers, software and systems developers getting down to the hard work of making the vision IoT investments pay off. Forecasting methodologies shifted in 2015 from the purely theoretical to being more anchored in early adoption performance gains. Gil Press wrote an excellent post on this topic Internet of Things By The Numbers: Market Estimates And Forecasts which continues to be a useful reference for market data and insights, as does his recent post, Internet Of Things (IoT) News Roundup: Onwards And Upwards To 30 Billion Connected Things. IoT-related value-added services are forecast to grow from $50B in 2012 to $120B in 2018, attaining a 15.71% CAGR in the forecast period. ABI Research’s forecast of the Machine-to-Machine (M2M)/Internet of Things value chain includes projected revenues and is part of an excellent analysis of the market by Woodside Capital Partners. 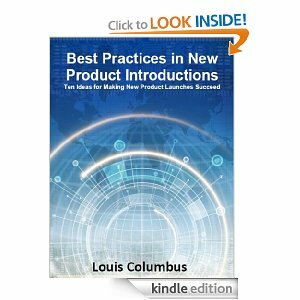 Source: The Internet Of Things: “Smart” Products Demand a Smart Strategy Using M&A for a Competitive Edge (PDF, no opt-in, 101 pp.). Cisco predicts the global Internet of Things market will be $14.4 trillion by 2022, with the majority invested in improving customer experiences. Additional areas of investment including reducing the time-to-market ($3T), improving supply chain and logistics ($2.7T), cost reduction strategies ($2.5T) and increasing employee productivity ($2.5T). The cited infographic also found that 50% of IoT activity today is in manufacturing, transformation, smart cities and consumer markets. Sources: Oracle Infographic: Energize Your Business with IoT Enabled Applications; Cisco, Embracing the Internet of Everything to Capture Your Share of $14.4 Trillion, 2014. Cisco predicts the global IoT market will be $14.4T by 2022. Industry-specific use cases will generate $9.5T (66%) including smart grid, connected personal vehicles. Cross-industry use cases will generate $4.9T (34%) including future of work initiatives (telecommuting and collaboration technologies), and travel avoidance. Source: Embracing the Internet of Everything To Capture Your Share of $14.4 Trillion, white paper published by Cisco. Software and services will be a $600B market by 2019, attaining a 44% CAGR from 2015 to 2019. BI Intelligence also predicts the number of devices connected via IoT technology will grow at a 35% CAGR from 2014 to 2019. 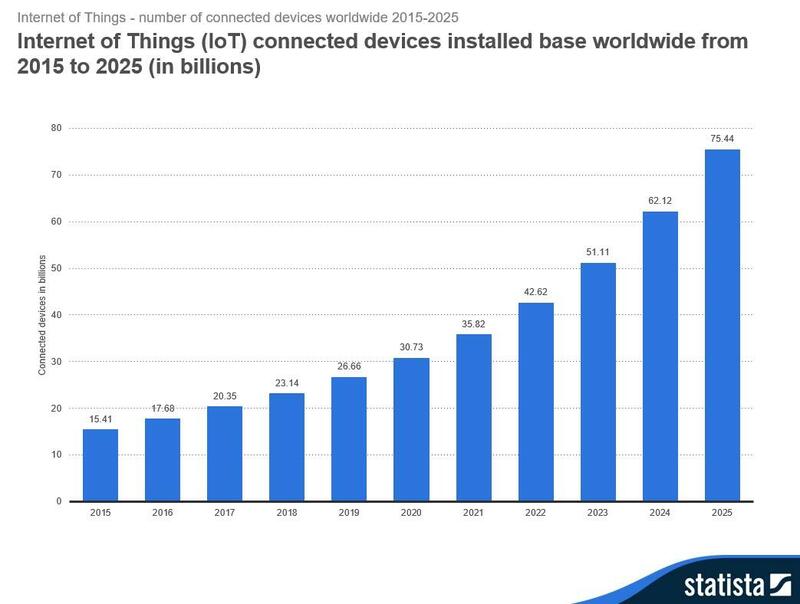 Source: Business Insider, The Internet of Everything, 2015 Slide Presentation. IC Insights predicts revenue from Industrial Internet of Things spending will increase from $6.4B in 2012 to $12.4B in 2015, attaining a 17.98% CAGR. 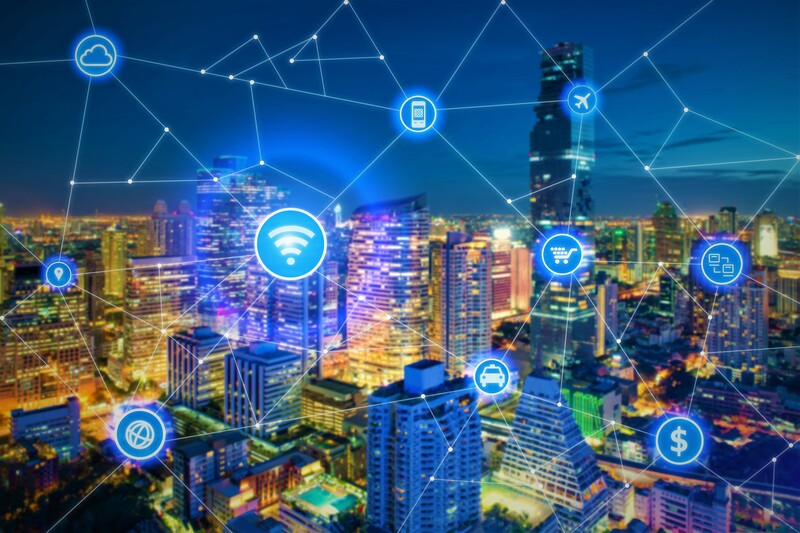 IC Insights predicts the Industrial Internet will lead all five categories of its forecast, with Connected Cities being the second-most lucrative, attaining a 13.16% CAGR in the forecast period. The research firm segments the industry into five IoT market categories: connected homes, connected vehicles, wearable systems, industrial Internet, and connected cities. Source: IC Insights Raises Growth Forecast for IoT. Manufacturing (27%), retail trade (11%), information services (9%), and finance and insurance (9%) are the four industries that comprise more than half the total value of the projected $14.4T market. The remaining 14 industries range between 7% percent and 1%. 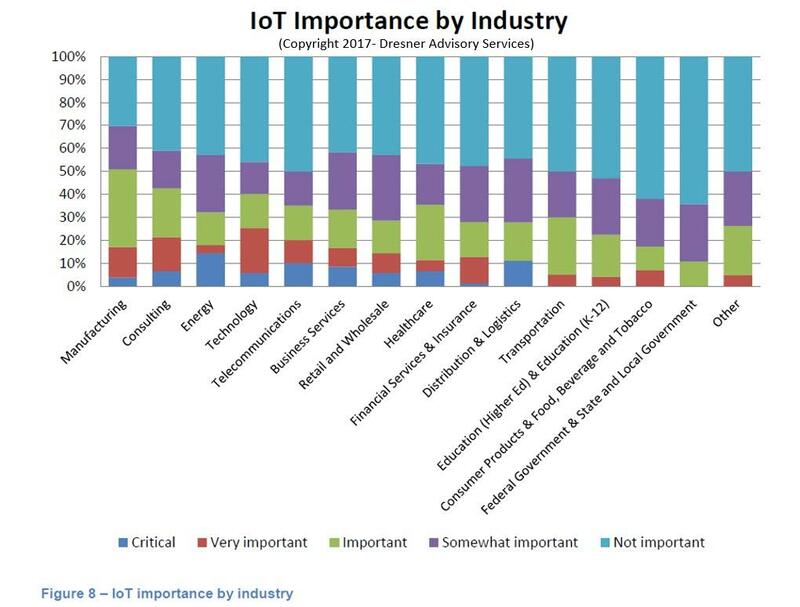 The following graphic based on Cisco’s analysis of the IoT market potential by industry and degree of impact. Cisco predicts Smart Factories will contribute $1.95T of the total value at stake by 2022. 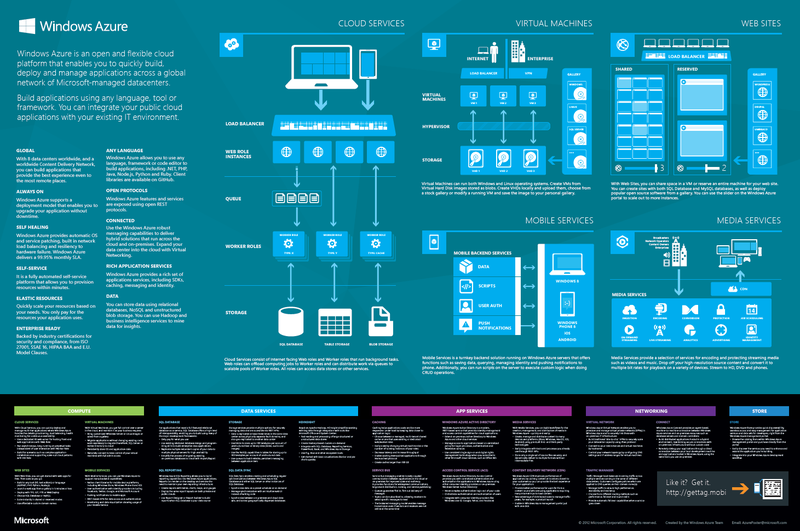 Source: Embracing the Internet of Everything To Capture Your Share of $14.4 Trillion, white paper published by Cisco. Intel Capital, Qualcomm Ventures, Foundry Group, Kleiner Perkins Caufield & Byers (KPCB), Andreessen Horowitz, Khosla Ventures, True Ventures and Cisco Investments are the leading IoT investors this year. Intel Capital is investing in a broad base of IoT-related technologies, encompassing 3D body-scanning and biometric sensors, wearable sand IoT infrastructure startups. Source: The Most Active VCs In The Internet Of Things And Their Investments In One Infographic. Vodafone’s latest Machine-to-Machine (M2M) study found that 37% of enterprises have projects targeted to go live in 2017. Vodafone defines M2M as technologies that connect machines, devices, and objects to the Internet, turning them into ‘intelligent’ assets that can communicate. M2M enables the Internet of Things. The following graphics compare M2M adoption trends from 2013 and 2015 and by industry. Source: 2015 Vodafone M2M Barometer Report (free, opt-in reqd., 36 pp.). New connections to the Internet of Things (IoT) will grow from about 1.7B in 2015 to nearly 3.1B in 2019. 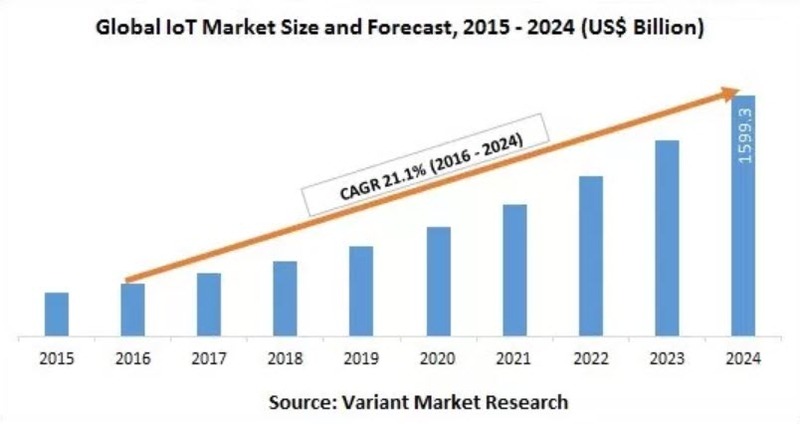 IoT applications will also fuel strong sales growth in optoelectronics, sensors/actuators, and discrete semiconductors, which are projected to reach $11.6B in 2019, attaining a CAGR of 26% during the forecast period. Source: IC Insights Internet of Things Market to Nearly Double by 2019. The worldwide revenue opportunity for IoT in manufacturing will grow from $472B in 2014 to $913B in 2018, attaining a 17.93% CAGR. 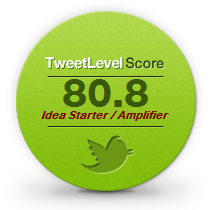 Worldwide revenue will increase from $2.29B in 2014 t0 $4.59B in 2018, attaining an 18.99% CAGR. 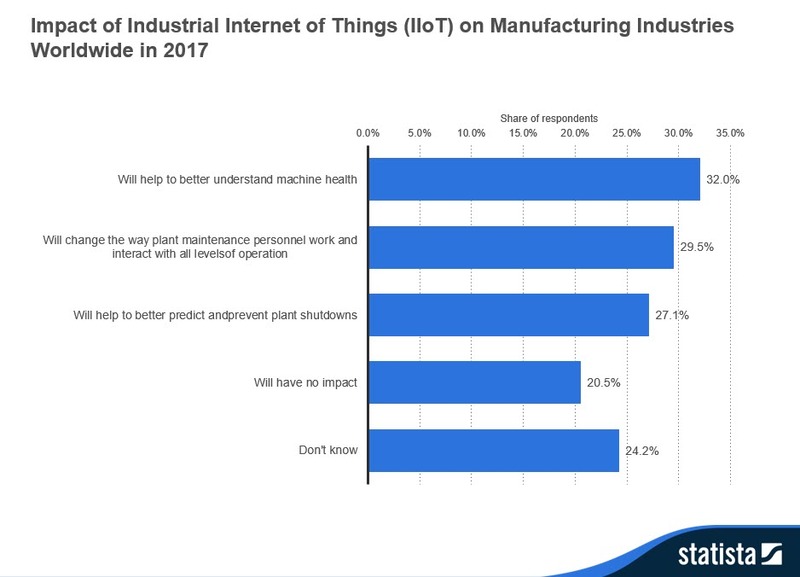 Source: Webinar: Internet of Things: Creating Business Value In Manufacturing. McKinsey estimates the potential economic impact of IoT in 2025 including consumer surplus is $3.9T to $11.1T trillion. Source: The Internet of Things: Mapping the Value Beyond The Hype, June, 2015. McKinsey Global Institute. The IoT market revenue will grow from $1.928B in 2013 to 7.065B in 2020. IDC predicts that the installed base of IoT units will grow at a Compound Annual Growth Rate (CAGR) of 17.5% from 2013 to 2020, reaching 28.1 billion units in the forecast period. Source: Worldwide and Regional Internet of Things (IoT) 2014–2020 Forecast: A Virtuous Circle of Proven Value and Demand Internet of Things. Global commercial building automation systems will grow from $58B in 2013 to $101B in 2021, attaining a 7.18% CAGR in the forecast period. Source: Intel Brief: Smarter Buildings & Homes With The Internet Of Things (PDF, no opt-in, 12 pp.). IoT in manufacturing market size is estimated to grow from $4.11B in 2015 to $13.49B by 2020, attaining a CAGR of 26.9%. Near Field Communication (NFC) technologies is estimated to grow at the highest CAGR during the forecast period due to a decrease in hardware costs. Managed service is expected to grow at the highest rate between 2015 and 2020. Asia-Pacific (APAC) is projected to witness fastest growth rate among regions. Source: Internet of Things (IoT) in Manufacturing Market by Software, Application, Platform, Service, & by Vertical – Global Forecast to 2020. Verizon has seen a 45% year-over-year revenue growth in their IoT business in 2014, with 4G LTE activations growing by 135%. 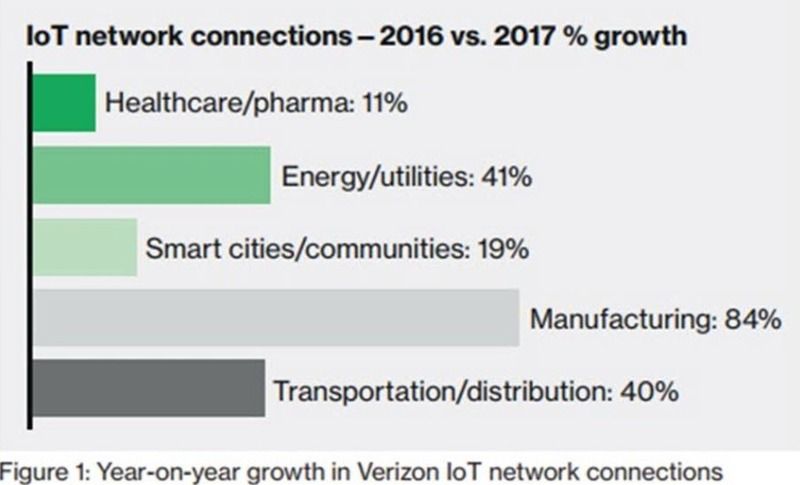 Verizon’s data also shows 49% year-over-year growth in the number of IoT connections in the energy and utilities Verizon data also shows 204% year-over-year growth in the number of IoT connections in the manufacturing sector. Source: State of the Market: The Internet of Things 2015: Discover how IoT is transforming business results. Worldwide spending on the Internet of Things (IoT) will grow at a 17% compound annual growth rate (CAGR) from $698.6B in 2015 to nearly $1.3T in 2019. 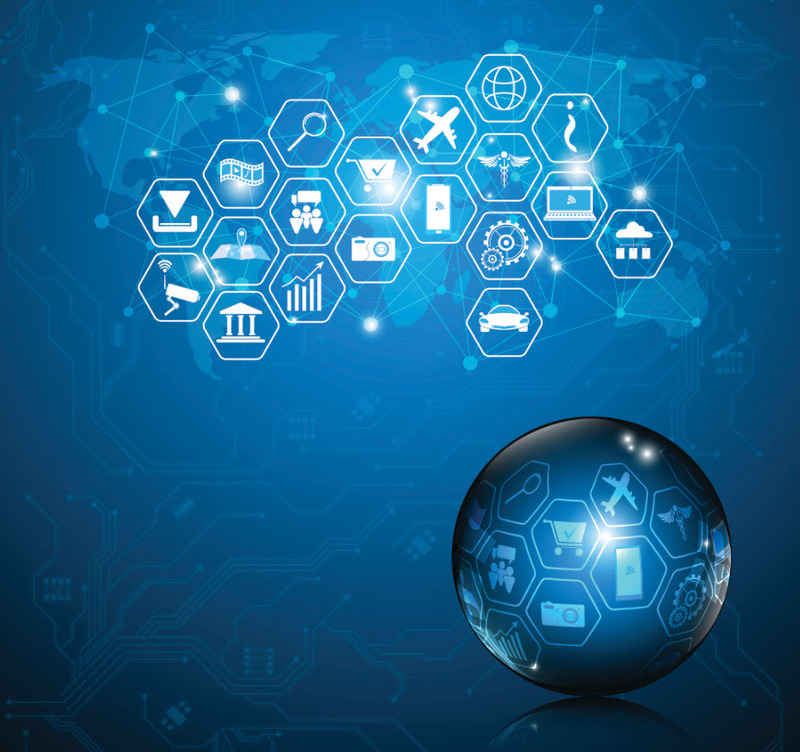 Manufacturing and Transportation led the way in worldwide IoT spending with 2015 totals of $165.6B and $78.7B, respectively according to IDC’s latest Worldwide Semiannual Internet of Things Spending Guide. Source: Internet of Things Spending Forecast to Reach Nearly $1.3 Trillion in 2019 Led by Widespread Initiatives and Outlays Across Asia/Pacific.